Fremont Street Pizza Decisions? Why Not Both? Why put yourself through the agony of deciding between partying with friends on Fremont Street and enjoying the best pizza that downtown Las Vegas has to offer? Lucky for you, you no longer have to make the toughest decision known to man. 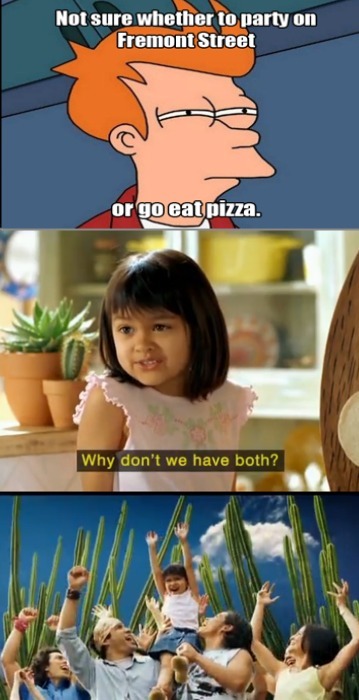 Pop Up Pizza allows you to do both. It’s like heaven on earth. Come by Pop Up Pizza to enjoy some delicious Fremont Street pizza and beer or wine, right in the heart of downtown. We’ll be waiting. Contact us at (702) 366-0049 for directions or menu inquiries.